fire rated roller shutter doors_Guangzhou OUAYNG Security and Building Material Technology Co., Ltd. The bottom rail shall be manufactured using mild steel angles of not less than 40mm by 40mm and 4mm thick bolted to back with the last slat sandwiched between the angles. The bolts shall not be less than 8mm diameter and fixed at not less than 300mm centres. In the event of a fire the door shall automatically close in order to prevent flame spread. The fusible link (rated at 80°C) fitted below the roller drum at one end is connected to a spring loaded automatic release arm. The release arm shall activate the automatic release/push down spring allowing the door to automatically close. The roller drum automatic release shall be fitted with a specially designed automatic controlled descent governor to match the door size and weight. The governor shall be designed to provide an average speed of between 250mm-300mm per second. Fire resistant Roller Shutters may be wired in conjunction with smoke detectors and fitted with an Automatic Reverse Touch Sensor strip where required, or specified. 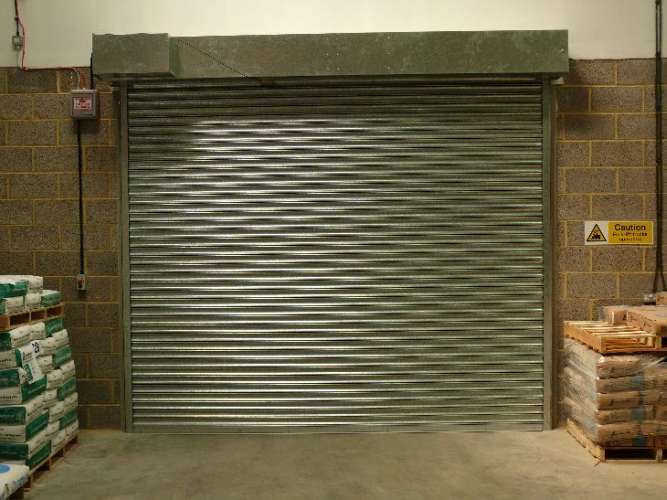 Roller Shutters operate by means of a flexible curtain guided in steel tracks and revolving on a roller drum. Hand operation is not recommended for shutters over 2200mm height, 3000mm width or 6m².